Mid-week mornings can be quite a rush and messy sometimes but that shouldn't mean you the most important part of your beauty routine - moisturizing your skin. Having dry looking facial skin is the worst. Your facial skin goes though the most because it is exposed to a lot of toxin from the environment as it is not covered like other parts of your body. 1. It heals the skin - My facial skin reacts so much and sometimes I tend to just ignore it but I have recently found a holy grail that i think i will be keeping. 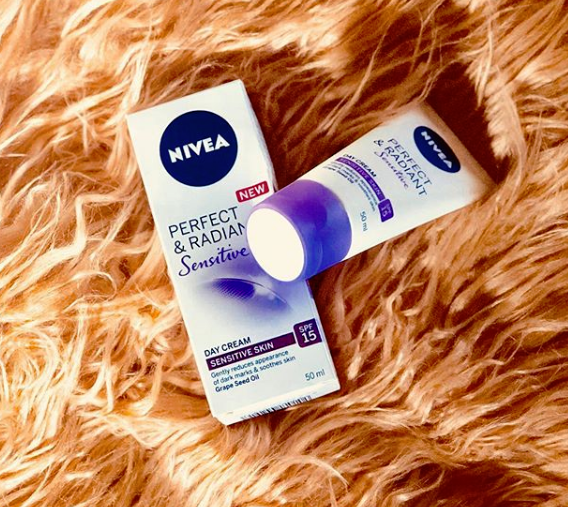 Nivea recently introduced a Perfect and Radiant Day Cream sensitive with SPF of 15. This cream is more than a layer to slather on in the morning because it does so much more than that. It evens out the skin tone, moisturises the skin and treats imperfections from the source. In just 7 days my skin was already looking clearer. all while upping the radiance. 2. Perfect Base - I use make up quite often and so a good base is very important. Before, I used a face primer only and most times I will have to stop putting on make up so my skin recovers as my pores become clogged. The Nivea Day Cream preps the face and readies it for base makeup. Even if you don’t wear makeup, the cream will nourish your skin and leave it supple. 3. Protects your face - The reality is, DRY SKIN WILL GIVE YOU WRINKLES before time. Day creams protect against the sun as well as they contain an SPF, which cuts out the use of an additional product. SPFs shield the skin from harsh sun rays so that you can take in the sunshine without having to worry about it damaging your skin.